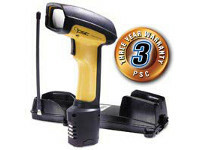 Datalogic Scanning’s PowerScan readers are the top rated industrial handheld data collection products on the market. 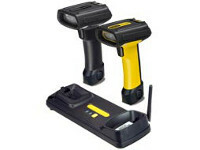 Synthesizing knowledge and experience, Datalogic Scanning is evolving the PowerScan family to include the PowerScan 8300 series:corded and cordless laser bar code readers featuring state-of-the-art performance for rugged industrial use. The PowerScan 8300 readers’ ergonomic enclosures are lightweight and well-balanced ensuring optimal operator comfort during scan intensive operations. Multiple good-read feedback features and a built-in metal tether hook for suspended applications ensure workplace productivity. 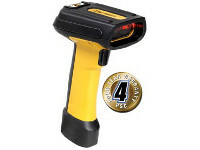 The PowerScan 8300 readers’ superior reading performance is enhanced by Datalogic’s patented Puzzle Solver™ technology for fast and accurate reading of standard, poorly printed and damaged bar codes. roaming for complex projects. An optional display with a 3-button keypad provides time and battery status and enables interaction with the host. 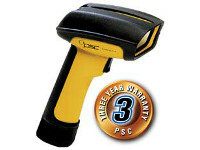 (operative at -22 ºF / -30 ºC) do not affect product performance or reliability. The PowerScan 8300 readers are offered with a full set of accessories: single and multiple battery chargers, desk/wall holder, belt and forklift holsters and a handsfree stand. All models have multi-interface capabilities built in featuring the most popular interfaces; RS- 232, Keyboard Wedge, Wand Emulation and USB. The Datalogic Aladdin™ configuration program provides user-friendly features that simplify the start-up procedure, even for inexperienced users.